A quick online search for “Dow rallies 500 points” yields a cascade of news stories with similar titles, as does a similar search for “Dow drops 500 points.” These types of headlines may make little sense, given that a “point” for the Dow and what it means to an individual’s portfolio may be unclear. The potential for misunderstanding also exists among even experienced market participants, given that index levels have risen over time and potential emotional anchors such as a 500-point move do not have the same impact on performance as they used to. With this in mind, we examine what a point move in the Dow means and the impact it may have on your investment portfolio. The relative advantages and disadvantages of these methodologies are interesting topics themselves, but the main purpose of discussing the differences in this context is to point out that design choices can have an impact on index performance. You should be aware of this impact when comparing their own portfolios’ performance to that of an index. Movements in the Dow are often communicated in units known as points, which signify the change in the index level. 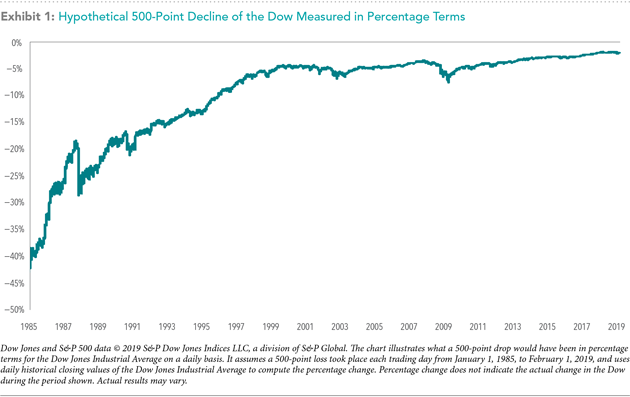 You should be cautious when interpreting headlines that reference point movements, as a move of, say, 500 points in either direction is less meaningful now than in the past largely because the overall index level is higher today than it was many years ago. It is also important to note that some investors may be concerned about other asset classes besides stocks. Depending on your needs, a diversified portfolio may include a mix of global stocks, bonds, commodities, and any number of other assets not represented in a stock index. A portfolio’s performance should always be evaluated within the context of your specific goals. Understanding how a personal portfolio compares to broadly published indices like the Dow can give you context about how headlines apply to their own situation. News headlines are often written to grab attention. A headline publicizing a 500-point move in the Dow may trigger an emotional response and, depending on the direction, sound either exciting or ominous enough to warrant reading the article. However, after digging further, we can see that the insights such headlines offer may be limited, especially if you hold portfolios designed and managed daily to meet their individual goals, needs, and preferences in a broadly diversified and cost-effective manner. Past performance is no guarantee of future results. This information is provided for educational purposes only and should not be considered. investment advice or a solicitation to buy or sell securities. There is no guarantee an investing strategy will be successful. Investing involves risks including possible loss of principal. Diversification does not eliminate the risk of market loss. 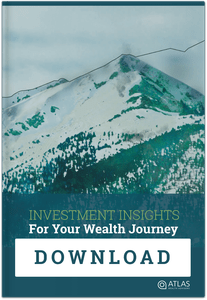 This material was created by Dimensional Funds Advisors LP (“Dimensional”), a Registered Investment Advisor registered with the Securities and Exchange Commission. Atlas Wealth Advisors, LLC and Dimensional are unaffiliated firms.